April-May-June 2019: we're playing Mondays only. See Where and When for up-to-date information. Visit our newsgroup, or our Facebook page, for last-minute changes. All are welcome! Drop in to any practice, we have extra gear to lend you. 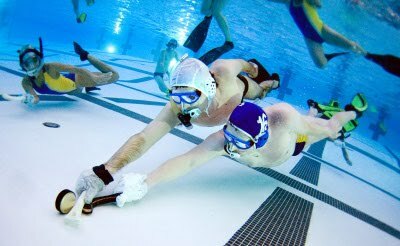 Underwater Hockey is a fast, action-packed (non-contact) sport played on the bottom of a pool by teams of 6 players with masks, snorkels, fins and short sticks. Players move the puck by pushing it or passing it, trying to get the puck into the opposing team’s goal. Underwater Hockey is a co-ed sport in which men and women compete on equal terms. It’s not about strength; it’s about teamwork and skill. And, no matter what your skill level, Underwater Hockey is a great way to have lots of fun, get fit, and make new friends. All you need to get started is a bathing suit. We’ll supply the rest of the equipment, skills training, and a good time!